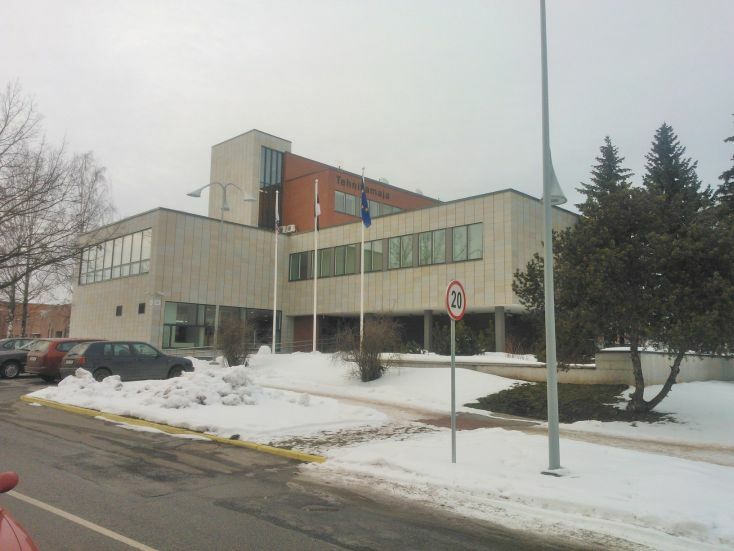 Tartu aims to reduce its ecological footprint through the more environmentally responsible behaviour of its citizens as well as the use of renewable energy and modern technology. Tartu has organised competitions for smart energy solutions, procured natural gas buses for its public transport lines, supported the adoption of electric cars, renovated city buildings for energy efficiency, implemented economical city lighting solutions, used renewable energy sources, etc. The purpose of the ‘Sustainable Tartu’ topic page is to disseminate information about the ecological and energy-efficient solutions in the city of Tartu. On this page, we try to gather interesting and inspiring examples and educational materials from the city of Tartu and its surroundings. Here we share our experiences regarding the city’s buildings, transport, street lighting and planning. We also collect the experiences of Tartu’s citizens and business enterprises. SmartEnCity (smartencity.eu) is an international cooperation project funded under the European Union’s Horizon 2020 research and innovation programme. The project started in February 2016 and will last for more than five years. Its main activities will take place in the first few years, while the latter years are intended for the assessment and dissemination of results. The project’s main objective is to implement a complete solution for a smart and economical urban environment to inspire citizens to make environmentally responsible decisions – one that could later be implemented in various other European regions. The project is based on the Smart Zero Carbon City concept, whereby a city’s ecological footprint and energy demand are minimised through the use of modern technology and its energy supply is based on renewable local energy sources managed via smart solutions. The project’s activities in Tartu aim to use investments to create a quality living environment which inspires the community of the pilot area to make environmentally responsible decisions and change their behaviour patterns. A smart community utilising participatory democracy with innovative technological solutions will create new experiences that could be implemented elsewhere. The main idea of the Tartu pilot project is to turn the city’s Khrushchyovka area (city centre area) into a so-called smartovka area. In addition to building reconstruction, this will entail innovative solutions in transport, street lighting and heating and cooling equipment as well as the creation of modern monitoring systems. 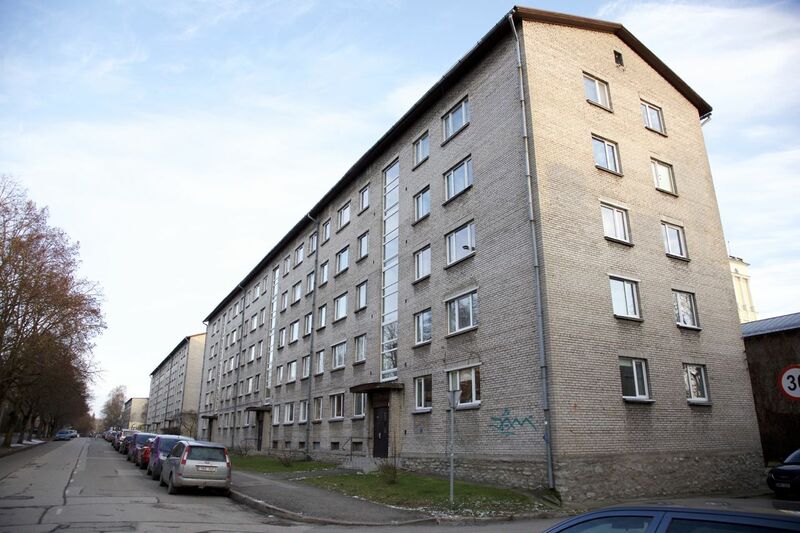 Creation of support measures for the partial co-funding of the renovation of the so-called Khrushchyovkas (apartment buildings made of silicate brick or large concrete blocks from 1950-1960) located in the pilot area of the city centre district. Classical renovation will also be complemented by smart solutions. Where possible, buildings will be fitted with solar panels for electrical energy production. Buildings for which this is not possible will be given a central hot water supply. Creation of a data exchange platform. ICT solutions for buildings and lighting: smart energy consumption measurement, monitoring and control. Creation of a district cooling service and directing the residual energy released from district cooling with the aid of a heat pump as heat into the district heating network. Creation of public recharging points for electric vehicles. Development of electric taxi services. Creation of a bicycle rental system. Utilisation of used electric car batteries for renewable energy storage and use. Creation of a smart LED street light network in the pilot area. Creation of a public transportation planning tool. Development and implementation of a social innovation and community inclusion model. Read more about the project at tarktartu.ee. The project is funded under the European Union’s Horizon 2020 research and innovation programme and will be implemented according to contribution agreement No. 691883. Why was the project initiated? Across Europe, the transport sector is responsible for around 20 percent of all greenhouse gas emissions, half of which is due to passenger transport. In order to reduce the ecological footprint of the transport sector, the quality and accessibility of public transport needs to be developed, especially in suburbs and rural areas. As the infrastructure necessary for developing public transport generally already exists, improvements in this field are being more and more driven by local politics and administrative capacities. Thus, connecting various ecological modes of travel, better ticket sales options, use of ICT, integrated schedules and better passenger comfort are the key to shaping the image of public transport and making it more attractive. The general objective of the project is to increase the use of public transport in cities and their suburbs. raising citizens’ awareness and guiding public opinion with the aim of increasing the use of ecological modes of travel within the city. For Tartu, the more specific objectives are identifying the necessary activities for increasing the level of public transport services (accessibility, specification and quality of means of transport, optimising routes after the approval of the network modernisation agenda, pricing policies, integrated payment options and ICT solutions), their initial financial economic assessment and developing the necessary activities for connecting public transport and other sustainable modes of travel. The main output of the project will be an action plan for increasing the attractiveness of public transport as a mode of travel and guaranteeing its sustainable development. The expected result is a rise in the popularity of sustainable modes of travel and a reduction in the negative environmental impact of transport. 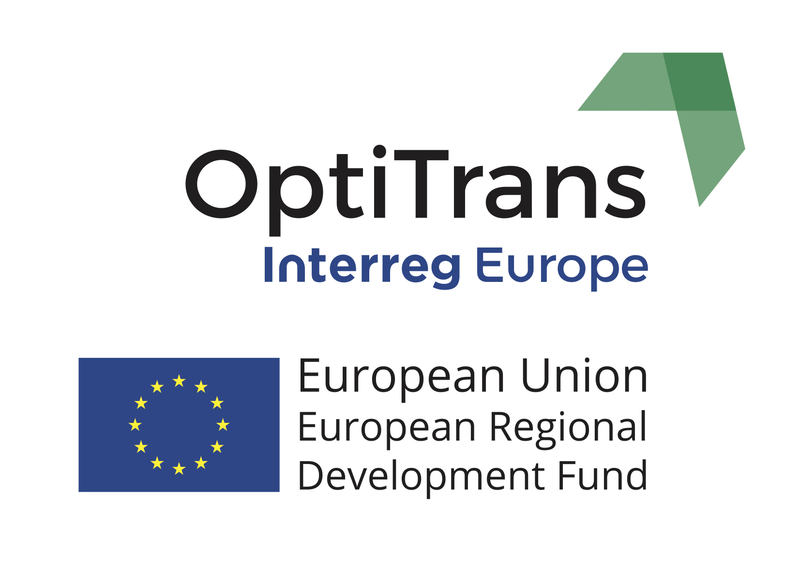 In addition to Tartu, OptiTrans partners include Baia Mare (Romania), Granada (Spain), Thessaly (Greece), Zadar (Croatia), and Abruzzo (Italy). The leading partner is the Ministry for Infrastructure and Agriculture of Thuringia (Germany). The project is being funded from the European Union’s Interreg Europe programme. In the framework of the project, a baseline study on the public transport of the Tartu region was carried out, on the basis of which an action plan for promoting public transport in the region is being prepared. With the help of study, we wanted to find out what today's challenges are in connection with public transport in the region? What are the subsidies to maintain or enhance the quality of public transport service? Who are the main drivers of development? What is the modal distribution of passenger traffic? As part of the survey, the risk analysis of public transport in the region was also carried out. Tartu operates 25 bus routes, which are serviced every day by 52 buses. Since Tartu is striving for a clean and more human-centred living environment, five of these buses are already environmentally friendly gas buses, with three more added in December 2016. 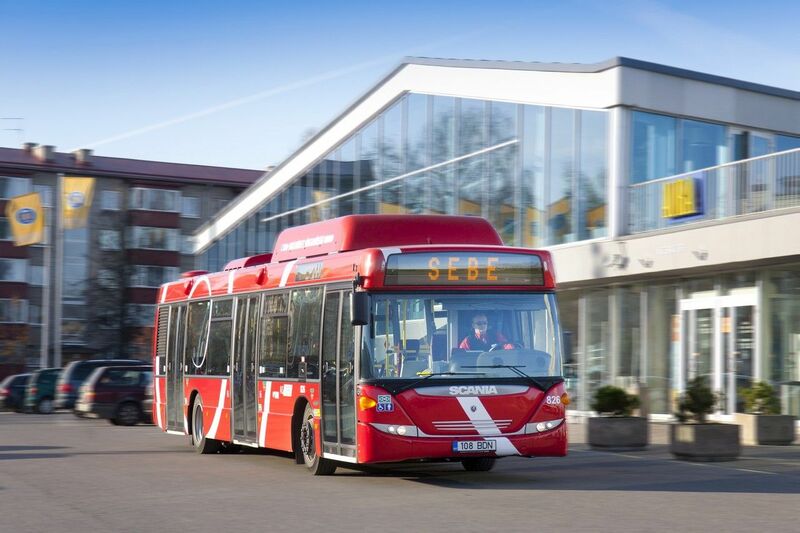 Quite soon, the number of gas buses in Tartu will rise to 62 and thus from 2019 all buses servicing Tartu city routes will be modern and ecological gas buses. We are also thinking about future sustainability and, when possible, intend to start using biogas ideally produced right here in Tartu to power buses on city routes. The European Union and Estonia have set a long-term strategic goal of increasing the share of renewable energy in transport – the goal is to raise the use of renewable fuels in transport to 10% by 2020. To achieve this, liquid fuels will be required to contain 5-7% biofuels, public transport will be shifted to renewable energy and alternative renewable energy sources will begin to be used in transport. Using e-vehicles, including electric buses, will assist in achieving these goals, i.e. reduce fossil fuel consumption, if the course of 100% of electricity for electric vehicles having to be generated from renewable sources is maintained. The adoption and development of electric vehicles has already been promoted and supported by most other European countries and cities for some time. Firstly, electric vehicles help attain a cleaner living environment and, secondly, it is also a rapidly developing field of business. Electric vehicles are simple in design and therefore their operation and maintenance costs are low. On average, electric motors contain about five moving parts, which are of course subject to wear, but in traditional vehicle engines these parts number in the hundreds. Electric vehicles require neither oil changes nor gearbox maintenance. Their only costs are those related to batteries. 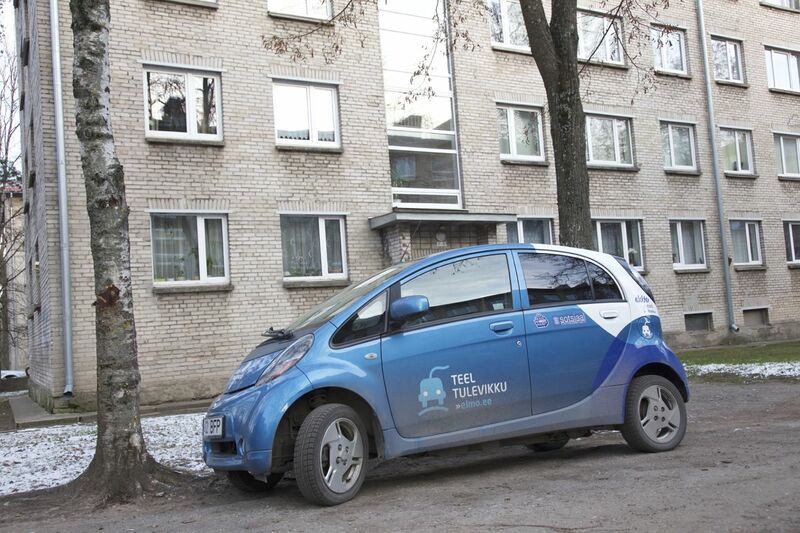 Of the 500 electric cars purchased for social workers in 2011 for Estonia’s emission allowances, Tartu received 30. The city government has purchased four additional electric vehicles for city officials. The electric cars granted to the city government lead to better accessibility of the services offered to citizens, primarily regarding social and communal services. Thanks to Estonia’s electromobility programme (ELMO), Tartu currently has 11 quick charging points for electric vehicles. The SmartEnCity project funded by the European Commission will see the construction of five additional quick charging stations in Tartu’s city centre area. Development of electric and gas vehicle parking concessions. In recent years, the city of Tartu has made a considerable effort to advance non-motorised transport, especially bicycle transport. Whereas in 2010 cyclists made up 1-1.5% of all traffic, by the end of 2016 that number had risen to 4.6%. To get a better overview of non-motorised traffic, in 2016, new non-motorised transport paths were installed with two automatic counters, with more to follow. 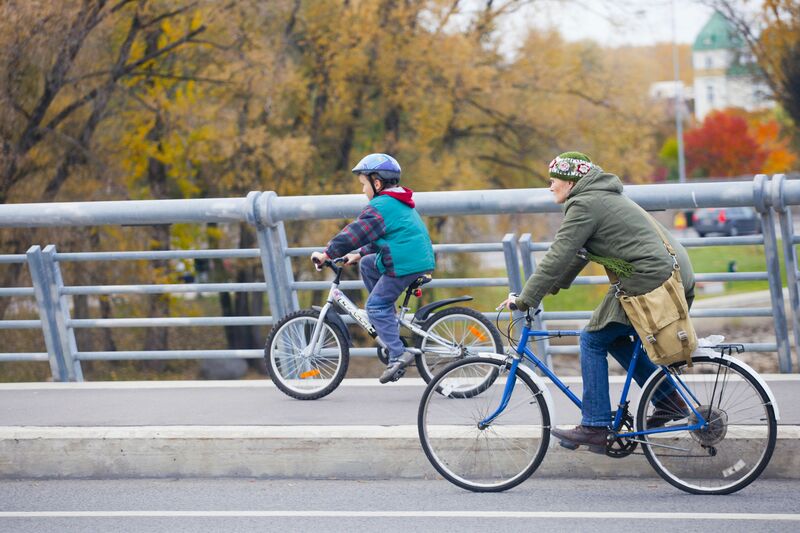 In order to encourage the use of bicycles in city transport, Tartu is planning to create a bicycle rental system and connect it with other means of public transport. The objective of creating the bicycle rental system is to achieve a greener and cleaner city environment, promote non-motorised transport, improve citizens’ mobility opportunities and health, use a more economical transport system and develop modern, smart urban space. Street lighting is an important part of every city in terms of guaranteeing citizens a safe living environment. At the same time, road and street lighting makes up an estimated 2% of electricity consumption across the world. Energy efficiency is receiving more and more attention in Europe. Good solutions for better lighting control are being sought and lighting technology is being upgraded. In some areas outdoor lighting makes up nearly half of the regional budget. Economical LED lamps with smart lighting control solutions can help local authorities attain energy savings of up to 85%. In recent years, the city of Tartu has made its street lighting more economical and environmentally friendly. On streets with higher traffic, nearly 1500 lights have been replaced (10-11% of the total number of street lights), more than half of which are radio controlled LED lamps. In the future, lighting can be integrated with various sensors (environmental, motion, parking, noise and other detectors) and technical solutions (security cameras, Wi-Fi base stations, etc.). Future smart street lights will be able to understand their environment and adapt to the conditions. The purpose of the upgrades is to develop a sustainable, economical and multifunctional street light network that meets the technical standards with a smart control system. In 2014, Tartu had 321 km of illuminated streets lit by 11,547 lamps. The lamps are connected by 227 km of overhead power cables and 126 km of underground power cables. The lamps are controlled via 151 control panels. 10,620 of the lamps in use in Tartu were HPS lamps, which were supplemented with 295 HID lamps and 632 LED lamps. 10% of the energy consumed by street lights was generated from renewable sources. In 2015, this figure was 20%. In 2010, Tartu’s street lighting electricity consumption was 7.456 GWh. By 2014, it had dropped to 7.361 GWh. The decrease in consumption was minimal – merely 95 MWh. The use of new LED lamps has not yielded significant reductions in street lighting energy consumption mainly because over time several new streets have been added (e.g. Idaringtee), which has increased the number of street lights. Street lighting energy consumption in Tartu is highest in the district of Annelinn and in the city centre (see Table 2.21). These areas account for 25% of the city’s total street lighting energy consumption, with combined consumption of 1.867 GWh. Annelinn and the city centre contain a total of 2,971 lamps and 46 control panels. 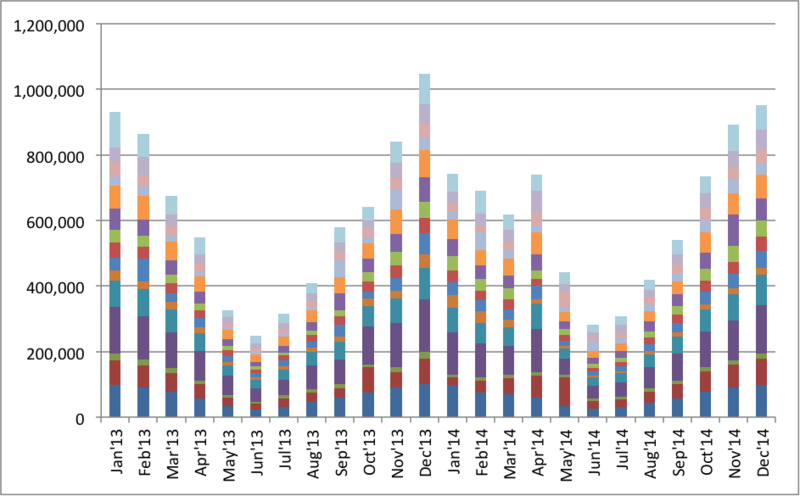 Street lighting energy consumption is seasonal, as shown in figure 2.7. Figure 2.7. Street lighting energy consumption. In 2015, 600 of the most powerful HPS lamps were replaced with new, energy-efficient LED lamps. At the beginning of 2017, Tartu’s street lighting included over 1200 LED lamps. Within the next nine years, Tartu City Government aims to replace all remaining HPS and HID lamps with LED lamps. To do this, the city has been divided into nine lighting districts (see Figure 3.4). These districts are comparable in terms of size, number of lights and control panels and energy consumption. Each year for the following nine years, all of the street lights in one lighting district will be replaced. The estimated energy savings from replacing HPS lamps with LED lamps are 70%. Actual energy savings will depend directly on the power and location of the lamps. According to calculations, at average energy savings of 70%, the payback period of these replacements is eight or nine years. Table 3.3. 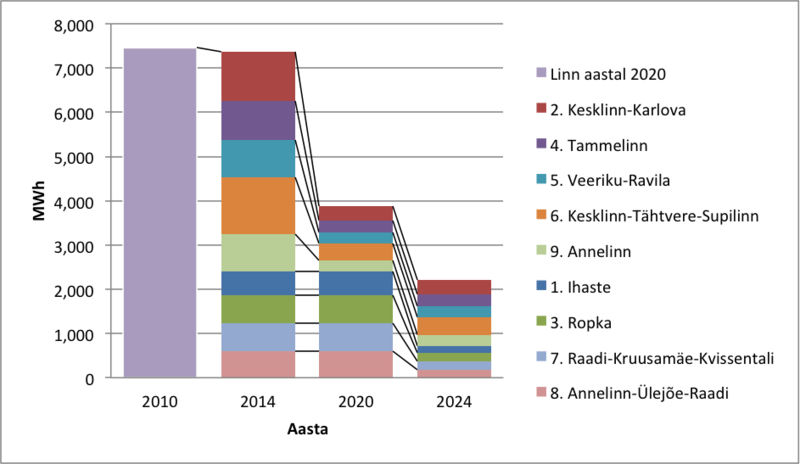 Tartu city street lighting energy consumption per district in 2010, 2014 and 2020 (unit: MWh; 2010 data per district not available). Figure 3.4. Tartu street lighting district map. According to the replacement plan, by the end of 2020 LED lamps should cover five of the nine districts. The number of street lights to be replaced in these five years is ca 7200, i.e. 68% of the total number of Tartu’s street lights. 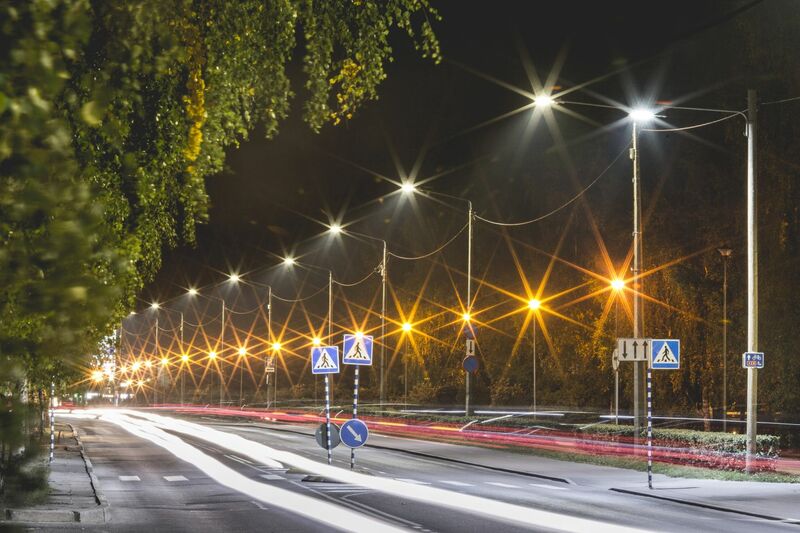 Investing in the adoption of LED lamps will reduce the annual energy consumption of Tartu’s street lighting compared to that of 2010 by 48%, i.e. 3.57 GWh. If the whole replacement plan is carried out, by 2024 the energy consumption of street lighting compared to 2010 will drop by 70%, i.e. 5.24 GWh. Street lighting energy consumption per district is illustrated in Table 3.3 and Figure 3.5.
collecting citizens’ feedback to identify the best lighting levels for streets. Figure 3.5. Tartu city street lighting energy consumption per district. 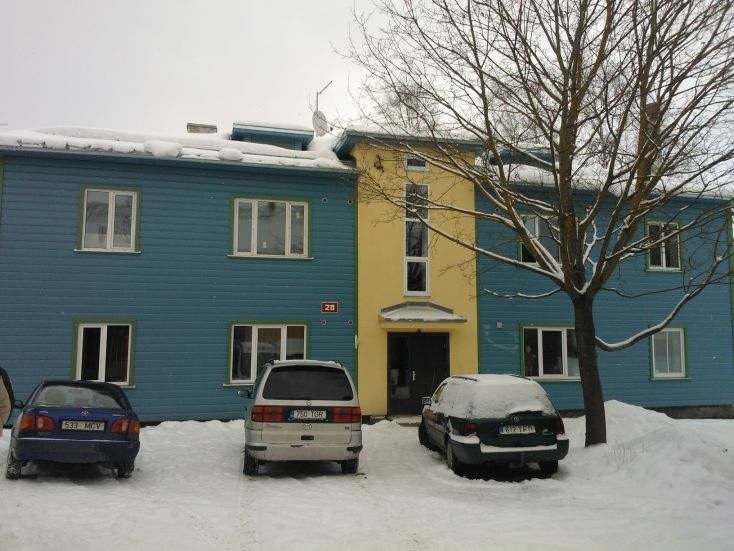 Location of building: Turu 16a, Tartu. Tartu city centre’s cooling station is a district cooling station whose purpose is to produce and supply cooling for commercial buildings, shopping centres, hotels, etc. District cooling has several advantages over traditional cooling, primarily in energy efficiency. Tartu’s district cooling station produces cooling using traditional industrial equipment as well as cold river water. Tartu’s city centre contains a variety of public buildings, including a water park, a theatre, four shopping centres, a science centre, and numerous office buildings. The buildings have different energy consumption peaks, which allows for energy consumption optimisation. The cold water of the Emajõgi River can be used as a free cooling source (energy from nature) from October to April. When water from the Emajõgi cools the water in the cooling network to the appropriate temperature (6 °C), there is no need to use industrial cooling equipment. When the water of the Emajõgi warms up, cooling production also requires the use of the industrial equipment. River water can be used for general cooling in autumn, winter and spring and for cooling turbocompressors in summer. District cooling is estimated to reduce traditional cooling energy costs by roughly 90%, and compared to a traditional cooling system, Tartu’s CO2 emissions will fall by 70%. As part of the SmartEnCity project, the district cooling station was fitted with solar panels to produce electricity for the station. The power of the district cooling station is 13 MW and the current span of the district cooling network is 1.6 km. The water temperature during spawning season must not exceed 10 °C. In order to reduce environmental impact, the outlet pipe should be located in a faster-flowing part of the river. 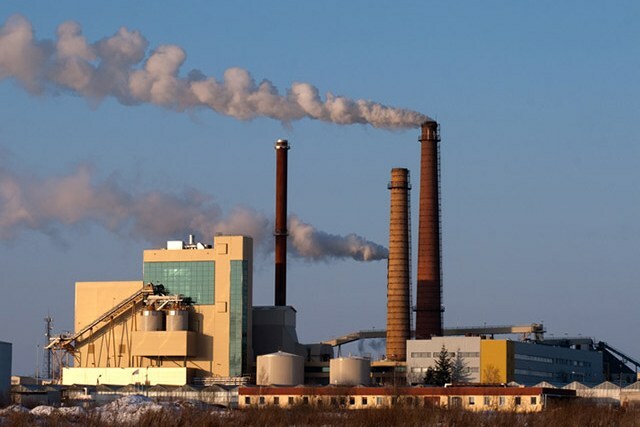 Type of building: Tartu Power Station is a cogeneration plant which generates electricity and heat at the same time. The electricity produced is transmitted to the electricity grid and sold on the power market of Nord Pool AS, while heat is directed to Tartu’s district heating network, which heats the city’s homes, shopping centres, commercial buildings, municipal and state agencies, nursery schools, schools, hospitals, cultural institutions, etc. In electrical and thermal energy production, the type of fuel used is very important. Tartu Power Station only uses local fuels: 80% renewable biomass (woodchips – low-value wood, logging waste) and 20% peat (which is not considered a renewable energy source, but is local). Using local fuels improves the local living conditions and economy and provides employment. Using renewable energy is environmentally friendly and reduces exhaust gas emissions. The CO2 emissions from burning woodchips and timber industry waste, for example, can be written off, as the CO2 released when burning biofuels is reabsorbed by plants through photosynthesis, which means the greenhouse effect does not increase. The energy efficiency of cogeneration comes from the fact that a certain amount of fuel simultaneously produces both electricity and heat. Producing the same amount of heat and electricity in separate stations would require 40% more fuel. The general operating principle of an electricity and heat cogeneration plant is the maximum use of fuel energy through the cogeneration process to achieve the highest possible total efficiency. The reasons for using woodchips are explained in more detail on Fortum Tartu’s website. Building energy figures: The heat capacity of Tartu Power Station is 50 MW and the power capacity is 25 MW. Energy from renewable sources: Tartu’s district heating network is one of a kind in Estonia: although the majority of the heat is produced at Tartu Power Station and boiler houses using biofuels, Fortum Tartu has also launched an open district heating project with the printing company Kroonpress. This means that the extra heat generated in the printer’s production process which is not used by Kroonpress is directed to Tartu’s district heating network. This network also receives extra heat from district cooling – the heat returned from district cooling consumers is directed via a heat pump to the district heating network to heat buildings and water. The job of today’s energy companies is to offer customers products they need, based on smart solutions, while using all the energy produced in the process without wasting it. For more information about the power station, visit Fortum Tartu’s website. 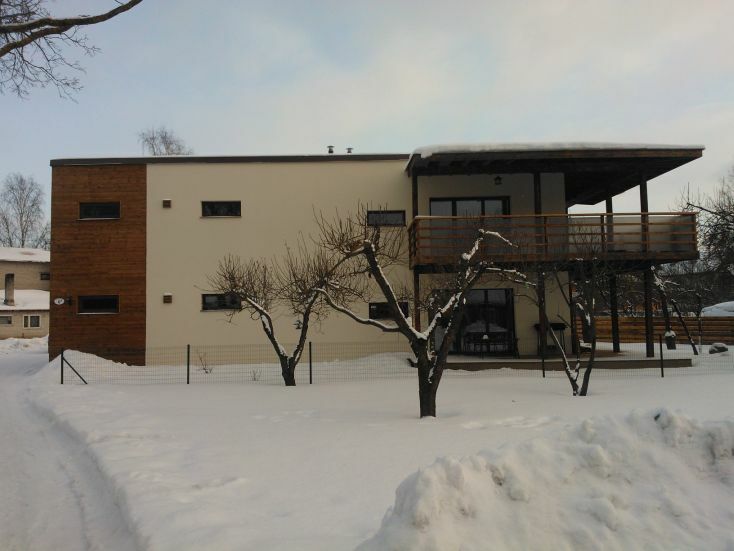 In two years, 2012 and 2013, Tartu City Government ran the Nutikas energialahendus (Smart energy solution) competition, rewarding energy-efficient construction solutions. The aim of the competition was to draw attention to novel solutions that, based on a building’s function, improve their energy efficiency and indoor climate. This building covers 4523 m2 and has 100 apartments. It was completely renovated in 2013. Extraction ventilators installed in bathrooms. Additionally, depreciated balcony railings were replaced with glass railings and each balcony was fitted with openable frameless glass systems. The expected savings from heating costs compared to those from before the renovations are 56%. The planned energy class was C and the heat consumption 351 MWh per year. After renovation, in 2013, the building’s heat consumption was 351 MWh per year. As a result of the renovation, the apartment building’s heating costs have roughly halved and the indoor climate has improved significantly. This is a commercial and residential building completed in 2013 at Vanemuise 45. Its total area is 1881.4 m2 and it contains nine apartments, two office spaces, a childcare area and an underground car park. The building utilises a unique geothermal energy solution that enables the preheating and cooling of ventilation air with a highly efficient circulation pump. Groundwater with a temperature of 5-10 °C circulates in calorifiers through which the ventilation air entering the building flows. In summer, this cools the outdoor air; in winter, it provides heat. Put more simply: in summer, heat from the air is stored underground and then used in the winter. Thanks to this, the forced ventilation does not need any additional energy for freezing protection and the building does not need separate cooling equipment. With the upcoming toughening of building heat retention requirements, nearly all new buildings will need cooling. If this were done using traditional active methods (air conditioning etc. ), actual energy efficiency would suffer. The solution at hand helps avoid this problem. The building also collects rainwater, which is then utilised in bathrooms and washing machines. Total energy consumption per m2: 110.5 kWh per year. 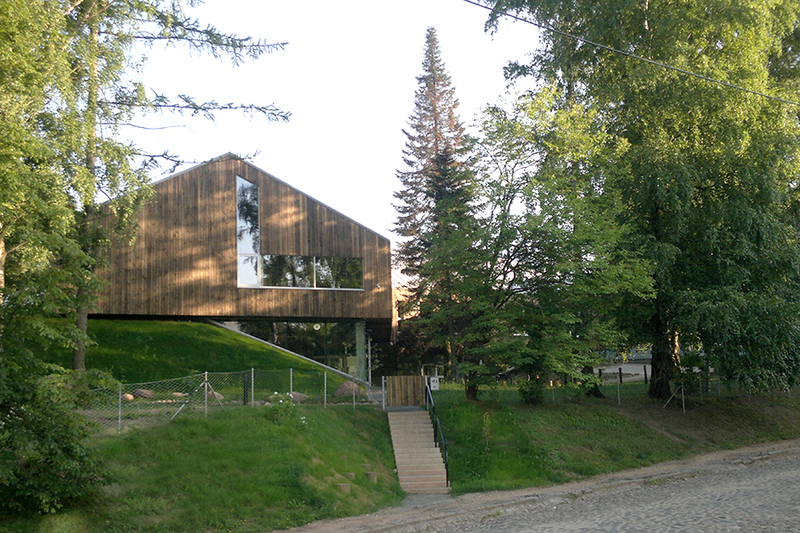 Tartu Nature School is a public building, completed in 2013, that was created to bring all of Tartu Environmental Education Centre together in one building. The building was planned and constructed with maximum energy and resource efficiency. The façade’s U-value (thermal conductivity) is up to 0.9 W/m²K. The roof was insulated with 600-mm thick rock wool. The U-value of the glass façade and roof is up to 1.4 W/m²K. The façade and glass roof ceiling of the greenhouse are made of double-pane insulated glazing in an aluminium profile. The openable windows in the walls are set in a thermally insulated aluminium profile with triple-pane insulated glazing. The insulated glazing unit is filled with argon gas The insulated glazing unit utilises selective glazing. The aperture filler’s U-value (thermal conductivity) is up to 0.9 W/m²K. The building’s energy consumption is 114 kWh/m² per year. The building’s energy class is B. The energy consumption of the greenhouse connected to the building is 219 kWh/m² per year. The building was created with the option of using solar energy. The economical paper warehouse of AS Kroonpress located at Tähe 133 is a 1350 m2 warehouse that was completed in 2012. The warehouse is used for storing paper rolls in stacks up to 7 m high. The rolls are delivered by trucks entering the warehouse via a double-door loading zone, where lifting machines pick them up and take them to the appropriate stacks from where, when required, they are taken to the printing machine. Three double-door aka heat buffer loading halls with enough room for the full freight trucks, which allows unloading at room temperature and helps avoid letting out warm air from the warehouse while the trucks are entering. 16 LED luminaires (145 W/pc) enable instant and automatic motion activated lighting in dim and low light. As LEDs are flexible and switch on instantly, they are more economical than standard luminaires. Rainwater falling on the roof of the warehouse and the rest of the building complex is directed into a 50 m3 collection tank before passing through cleaning filters and being sent directly to production. The utilisation of rainwater began fully in April 2013. By the end of that year 856 m3 of rainwater had been collected: 15% of the total water consumption of the company for that period. Hommiku 6b is a 337.2 m2 two-storey residence for two households. The building was completed in autumn 2012. Based on Estonian energy label: 117.2 kWh/m2 per year, i.e. class A. An air-to-air heat pump type heater, which allows using electricity for heating with an up to five-fold efficiency factor. Constant fresh air is provided by a Paul Novus passive house ventilation system with heat recovery, which is also energy-efficient. Heat recovery is 93%. The interior finish is 2-3 cm thick and uses natural finishing materials (Estonian Safran and Saviukumaja lime plaster and clay plaster), providing passive regulation of the uniform indoor climate. The careful planning and attention to detail of this building is remarkable. The key in the designing of this cosy and energy-efficient building was careful analysis of needs and communicating them to the designer, and thorough attention to detail in the planning phase. 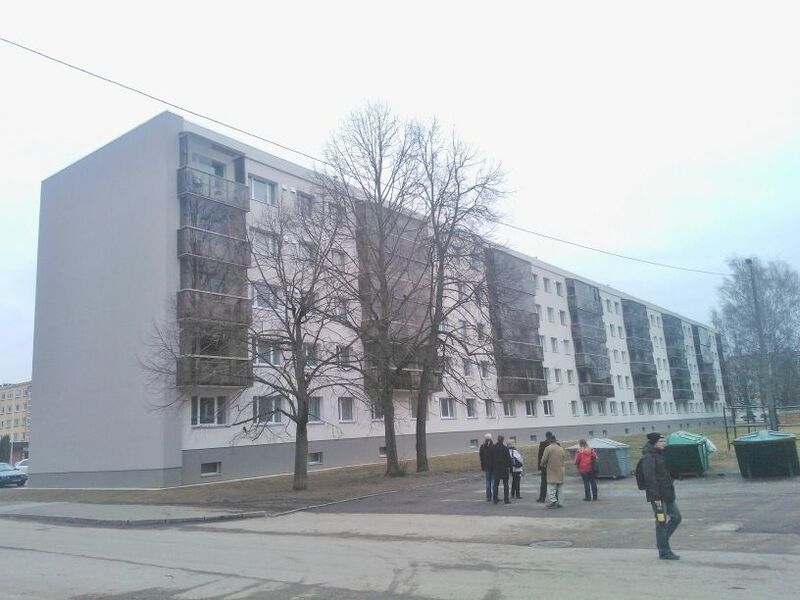 The Kaunase pst 19 apartment building is a 3238 m2 five-storey prefabricated building with 45 apartments. The building was completely renovated in 2012. Constant monitoring of the indoor climate by the apartment association’s management, who keep homeowners informed. The estimated heat consumption of the building is 47.1 kWh/m2 per year. Energy label: Class A (estimated). The estimated energy savings based on the project were 65%. The energy savings achieved based on data from the first three months were 54%. Energy savings in subsequent years should be greater and the projected savings attainable, since control of the new systems can still be optimised, and as the building’s insulation dries, heat loss will decrease further. This is an education and research building with a net area of 6028 m2. 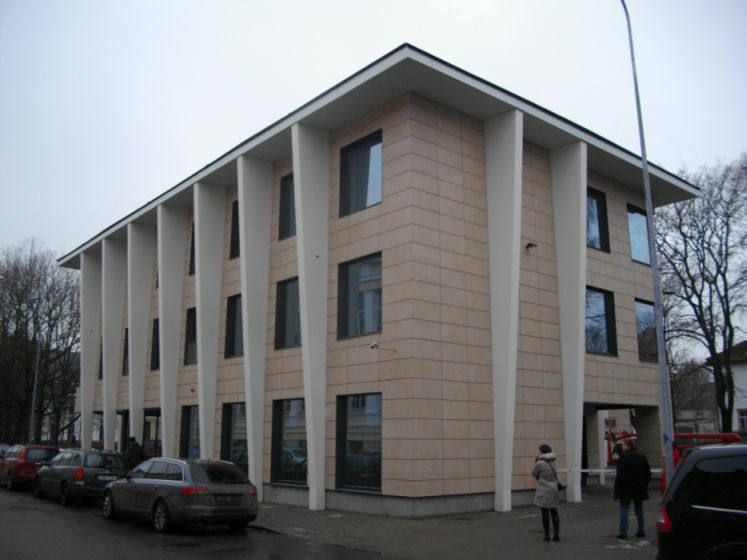 It is one of the newest fully renovated education and research buildings in Tartu. The building is a place of study for future energetics, technotronics, ergonomics, aviation and production engineering specialists and experts. In addition to studies, it is a site for active research into the fields of renewable energy and metal processing. Indoor climate control based on people in the room: the rooms’ climate is controlled using two factors: The amount of CO2 in the air and the indoor temperature. As the amount of CO2 in the room rises, fresh air intake is increased, while used air is extracted. If there are no people in an office or classroom, air exchange is minimised by closing the respective ventilation air valve. Room temperature is controlled via automatics and thermostatic valves, which shut off the main radiator intake valves as the temperature rises due to external heat gain or when opening windows. This helps reduce district heating consumption. Where possible, the ventilation unit uses cooler external air to cool the rooms. In order to improve the work environment and achieve electrical energy savings, lighting is controlled using motion and light detectors. The heat produced in the boiler equipment laboratory is cleverly utilised: The Kreutzwaldi 56 building contains a boiler equipment laboratory for study and research purposes that is connected to the building’s heating system. Whereas elsewhere in the world the heat produced in similar laboratories is directed outside or into sewage (some Finnish and Latvian laboratories), the heat produced from biomass burning research at the Institute of Technology is directed to the building’s own heating network, which helps reduce heating costs and energy consumption. Energy is produced as an elevator moves down: when the elevator moves down, its engine acts as a generator and produces electricity. The energy thus produced is consumed in the building’s own electricity network. Electricity: 31.9 kWh/m2 per year. Aleksandri 28 is a two-storey vertical-log house with eight apartments that was constructed in 1912. It is heated by stoves, ovens and fireplaces. The building’s average annual fuel consumption before renovation was 65 stacked cubic metres of fuel wood. Electric radiators were used for additional heating in the apartments. The estimated electricity consumption was 4 MWh per year. Total energy consumption was 207 kWh/m2 per year. Renovations were undertaken due to the poor overall state of the building. The roof was leaking in places; the rainwater pipes were damaged with rainwater running down the walls; and the exterior siding had gone unpainted for a long time. The foundations had sunk and the lower beams had rotted in places. The building’s heat retention was insufficient for residents. Due to rapid cooling, the temperature in the living spaces fluctuated wildly. Thorough renovations were required to stop the building from deteriorating further. Although the building is situated outside the official ‘area of cultural and environmental value’ of Karlova, the residents wanted the renovations to achieve low energy consumption while preserving the architectural style characteristic of the area. Since the apartments’ local heat sources are ovens and stoves, which use biofuel, reconstructing the technical systems was considered impractical. The natural extraction ventilation was also preserved, while adding fresh air valves to the outer walls to provide combustion air for fireplaces and sufficient fresh air intake to maintain the indoor climate. Energy efficiency is achieved through thermal insulation of the building envelope, using special solutions to guarantee a long life for the old wooden house. The insulation system is unique in its use of loose wool to insulate the walls. The thickness of the insulation layer was chosen so as to protect the load-bearing structures from the effects of outdoor temperatures. The insulation guarantees low energy consumption, while keeping the indoor temperature uniform. The insulation of the external walls, including wind barrier boards, is 170-200 mm thick. The windows were relocated to the insulation plane. The eaves were extended to maintain the external proportions of the building. The wall were insulated with loose wool using wet installation, which guarantees uniform insulation without air gaps on an uneven wall surface. This is extremely important when renovating old houses and often fails to be considered due to insufficient knowledge or skills when using wool insulation boards or rolls. The house is a prime example of preserving a valued milieu using a comprehensive and energy-efficient approach with the purpose of providing residents with modern and comfortable living conditions. Building energy consumption: 99 kWh/m2 per year (after renovation, annual fuel wood consumption dropped to ca 35 stacked cubic meters). 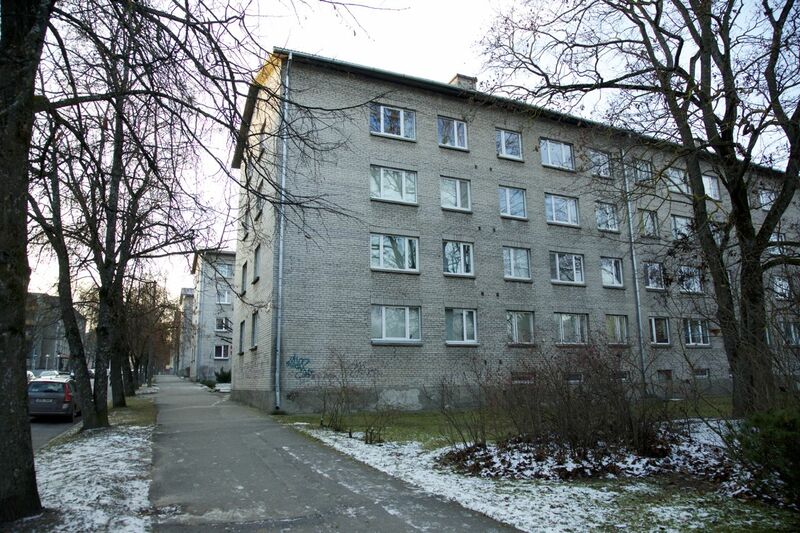 Näituse 19 is a four-storey apartment building constructed in the 1950s with an enclosed net area of 1010 m2. The building is situated in the ‘area of cultural and environmental value’ of Tähtvere. 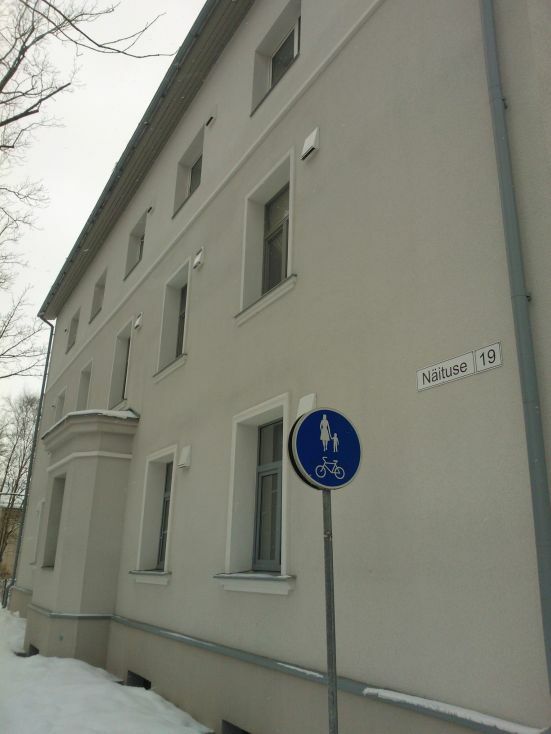 The Näituse 19 apartment building is one of the first in Tartu and Estonia as a whole to undergo comprehensive renovation using SA KredEx’s renovation support system. It is one of the first apartment buildings to be made energy-efficient despite the architectural constraints. 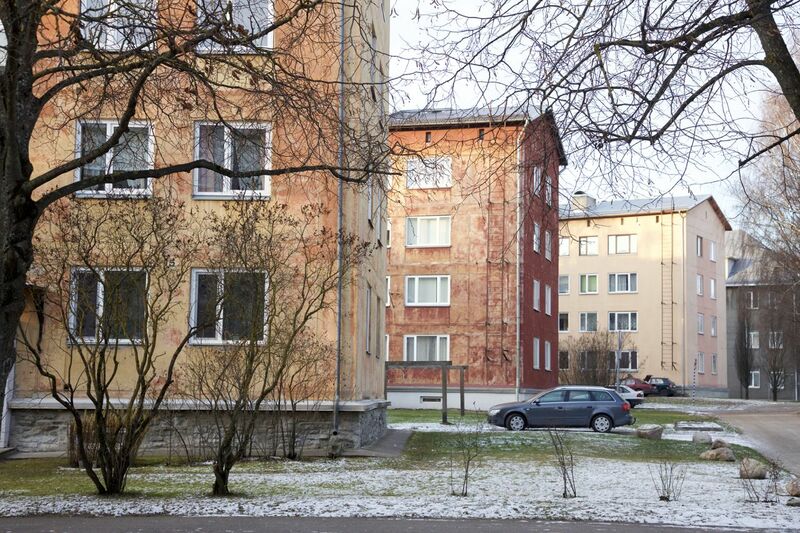 Tartu has large ‘areas of cultural and environmental value’ where the structural engineering level of buildings does not meet current standards. The reconstruction of Näituse 19 is a good example of how a comprehensive approach can be used to improve living conditions even in such areas. The building underwent comprehensive reconstruction, which included insulating the building envelopes, while maintaining the original proportions of the building and not changing its external appearance too noticeably. Maintaining the external appearance required copying the cornices and other decorative elements with the insulation. The building’s original heating system was a gravity distribution system with pipes in the attic heating external air. The heating system was updated and made energy-efficient by installing new radiators fitted with thermostats and individual energy consumption meters. The original ventilation system had been damaged through apartment renovations and was partially non-functional. 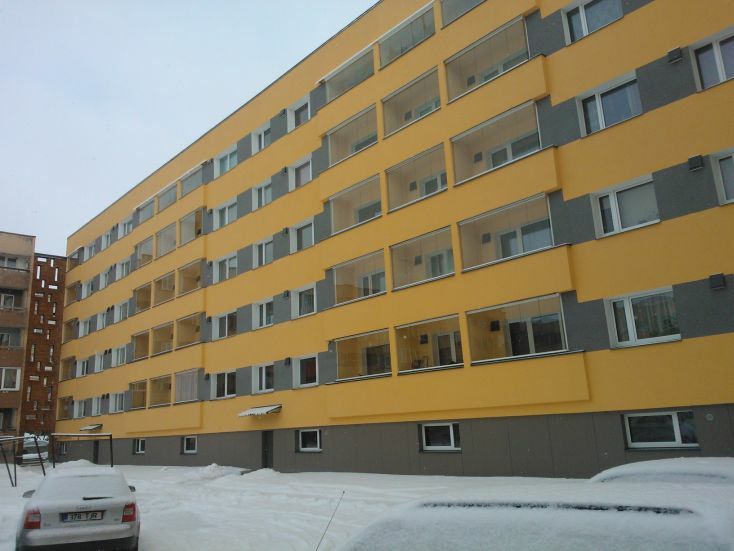 In order to achieve an indoor climate up to current standards and lower energy consumption from heating ventilation air, the building was fitted with apartment-based ventilation units with heat recovery. Thanks to harmonised heating, ventilation and building envelope reconstruction, the building’s energy consumption was reduced and the indoor climate improved, while maintaining the building’s cultural and environmental value. Building thermal energy consumption for heating: 99 kWh/m2 per year. Location: Supilinn, on the sports park side of Herne Street. Type of building: single-family home, new structure erected on an empty lot. Importance regarding environmental sustainability: as construction is expensive, the building was designed with minimal running costs in mind. 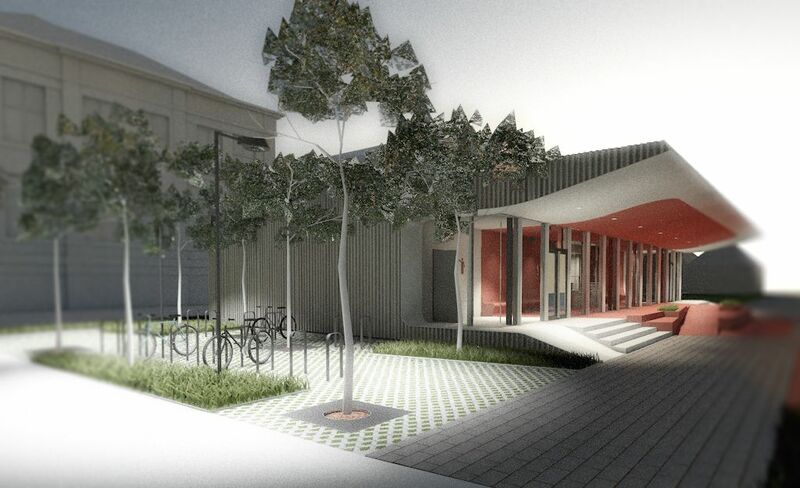 Unfortunately, it could not be constructed as a passive house due to the building’s orientation. Thus, it was constructed as a low-energy building. Building energy figures: the energy class of the building is B, according to which the building’s energy consumption is 110 kWh/m2 per year. It should be noted that heating and hot water are provided by a ground source heat pump running on electricity. In calculations, this is considered electric heating, which has a weighing factor of 2, meaning that the calculated energy consumption is two times lower (54.82 kWh/m2 per year). The actual energy consumption has proven to be slightly lower – the 12-month average was 53.8 kWh/m2 per year. The overall environmental sustainability principle of the building is also complemented by the use of certified green energy. The walls are timber-framed and insulated with 350-mm thick mineral wool. The building has a heat recovery ventilation unit (the heat recovery rate being 93%). Since this is a new structure, there are no direct savings to point out, but monthly expenses (water and electricity), depending on the season, fall between 80 (August 2015) and 250 euros (January 2016). 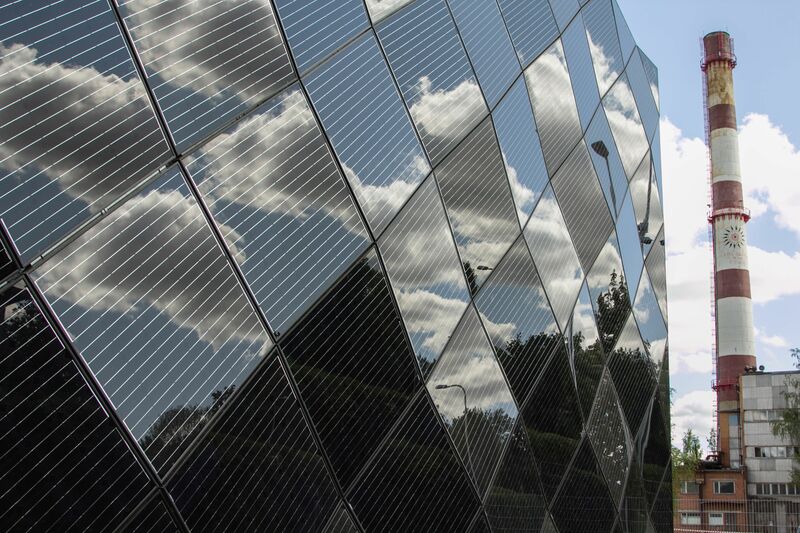 Renewable energy supplies: the building uses 100% green electricity, i.e. electricity produced from renewable sources. Due to the high initial cost of the investment, there are no solar panels, but the roof structure was built with sufficient spare strength to allow the installation of solar panels, should the opportunity arise. The south-facing second floor of the building has roller blinds. The summer sun does not reach the first floor because the sun is too high. The roller blinds are unnecessary during winter, when sunlight is wanted in the house. There is no separate cooling system because, according to calculations, the annual need for cooling is so small that just opening the windows is enough. The house has excellent heat retention, which means that if the windows are kept open during the night and the roller blinds closed during the day, the house stays cool. In order for the air density not to exceed 0.7 m³/m²h, it was measured twice, a result being achieved on the second try. The stadium building of Tartu Mart Reinik School will be completed in summer 2017. The stadium as a whole will be renovated at the same time, with the entire complex to open in August 2017. The artificial turf field at Riia 25 is heavily used every day by students and training groups. Each week, the stadium may be used by up to 1000 people. The purpose of constructing the stadium building is to make the life of students and those doing exercise who are using the stadium more convenient, reduce strain on the school’s changing rooms and keep school spaces cleaner. 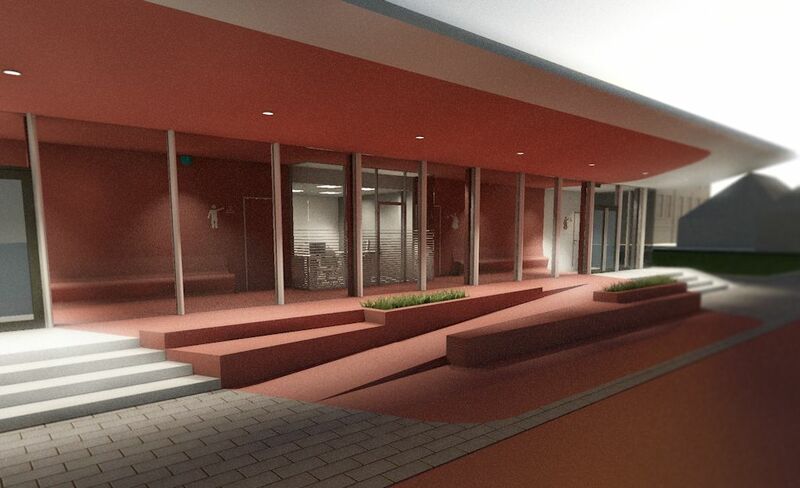 The building will have four changing rooms, two shower rooms and two saunas, plus bathrooms, a waiting area and a room for teachers and referees. The construction of the Riia 25 stadium building is being partially funded under Framework Programme 7 and the Osirys project. The project will see the development of innovative environmentally sustainable construction materials. The stadium building in Tartu will be one of three demo buildings using the new panels. The materials being developed as part of the project are an internal wall panel, an external wall panel and a glass façade element, all of which are made from natural materials, weatherproof, easy to recycle and suitable for use in both Southern and Northern Europe.